When some get air, Marcelo gets high! Before he died at the age of 36 on the morning of the 11th day of May 1981, Bob Marley wrote: “Jam's about my pride and truth I cannot hide, to keep you satisfied. True love that now exist is the love I can't resist, so, jam by my side”. “The Jam” conundrum has puzzled people for generations (whether or not Bob Marley fans), but one thing for sure is that "jammin" definitely means “to do whatever you do with passion and purity”. With their love of skateboarding, those are words that the jammers at the 9th Oi Vert Jam 2011 are probably acknowledging, especially since the Jam ended a couple of hours ago at Rio de Janeiro and saw the victory of a majority of Brazilians, whom Bob Marley saw as brothers in chains, ready to go back to Zion (Ethiopia)…. Then, might it also be possible that in the future, Brazil supersedes the US as a country where per capita skateboarders is #1? 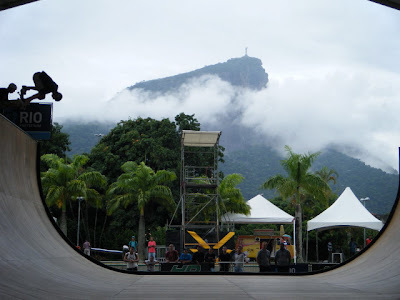 Not impossible, but in the meantime this week-end, the Boys From Ipanema were not walking to the sea, but to the Oi Vert Ramp 2011 that was revolutionary in its simplicity: the half pipe was 18m wide and 4.20 m high, had two canyons - one on the other - in the middle of the lane with 1.5 m wide each. 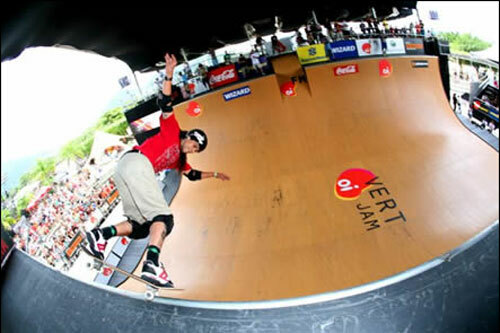 "We always try to make a ramp more challenging for the vert riders. And this was the first time that some of them previously consulted to see how they preferred". "Build a barrier of 3 meters wide was the most appreciated, as it increases the difficulty of the maneuver and speed requires more time to initiate the turn" said Sandro Dias, project supervisor. 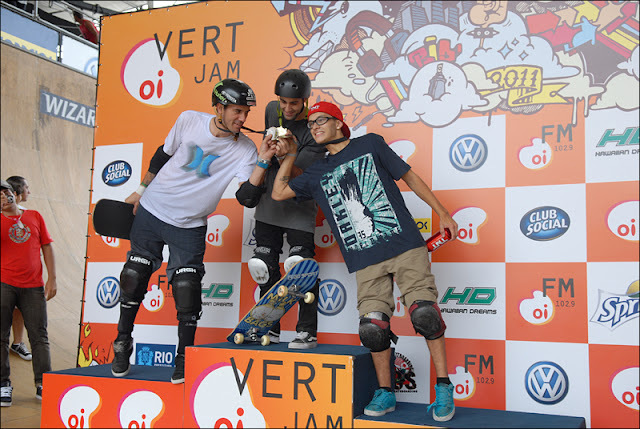 Marcelo Bastos landed 1st for the second time at Oi Vert Jam and even with the large contingent of renowned foreign competition, the second place went to Bob Burnquist and Ron Gomes third. "I had my back completely on improvisation, with no plan and ended up snapping the line maneuvers. I found that Bob had to overcome that I third round and am very happy to win here again. It's a great start for me " said Marcelo Bastos for the release of Oi Vert Jam. 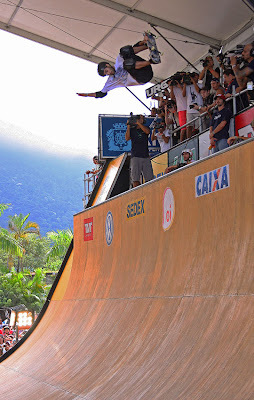 Bob Burnquist said that "(he) was psychologically shaken with two falls, but had no reason to lower his head.” Bob added: “ Before going down the ramp, I thought about my daughter (Lotus, with Birthdays today), my wife and at various times that turned the game on last lap". ﻿﻿﻿﻿﻿﻿﻿﻿﻿﻿﻿﻿﻿ "I am very happy to finish in the top two talents of the new generation of skateboarding". At the third place, Rony Gomes said that "I hit everything I had planned. It was too good. The new generation comes with everything" . After all of this has been said and done, I hope you feel a little bit like Bob Marley and say: “I wanna jam it; I wanna jam it”!